Clients. Some gripe about them and others have relationships closer than family. Sometimes, we ARE them. 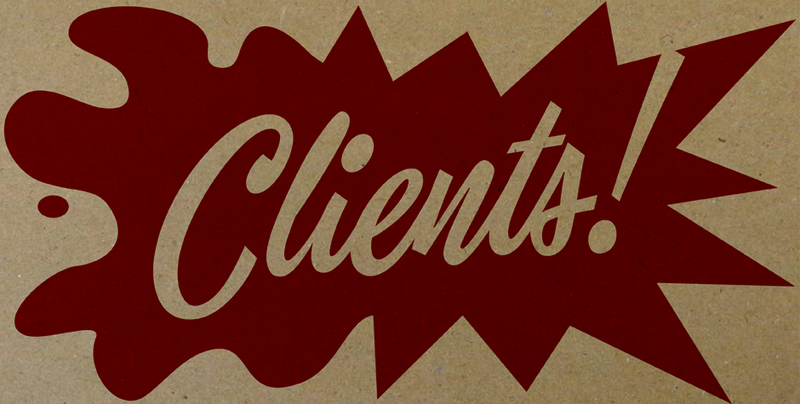 Truth be told, designers need clients. We earn a living from them, we both teach each other and more often, we learn something new and do our best work in collaboration with them. Clients become friends and bring out the best in us, which is why I love and appreciate my clients. So how can I grow our relationship and help them to understand design better? WHY SAYING NO TO CROWDSOURCING OR SPEC WORK. This is a great article that goes in depth explaining why you get what you pay for. Sure, we all love getting a bargain meal deal, but wouldn't you be concerned about how much real food is actually IN fast food? There's a reason why they call it fast...easy come, easy go. 7 CLASSIC STARTUP FOUNDER MISTAKES. Every business was once a startup. And when some businesses end, another startup begins with lessons learned (or sometimes not). Kathryn Minshew shares common mistakes made by startup founders and reveals the remedies to each. © TM DEFINED. Nuff said. I KNOW IT WHEN I SEE IT. Been there, done that. No more, please. SPOT VS. PROCESS. At the beginning, they may be neck and neck, but eventually one will win out...when it comes to designing for print. It was once cheaper to print as 1 or 2 spot colors, but digital print has improved in quality and affordability. HOW TO BE A REALLY GOOD CLIENT. While Number 17 was still operating as a wildly successful two-woman multi-disciplinary design studio, they created smart design pieces for STEP Inside Design Magazine. Although their 27 comic series was created in 2009, many are still relevant. THOUGHTS ON DESIGN PRICING. Designer David Airey along with other seasoned designers and business development consultants give intelligent discourse on pricing fairly. DESIGNER RELATIONSHIPS. And full circle to where this article all started. Why some client/designer relationships work better than others.